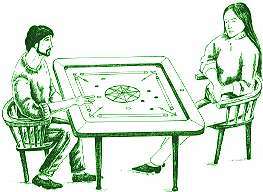 The origins of Carrom as we know it are quite obscure. Although widely believed to have originated hundreds of years ago, some believe it originated in India, while others link its origins to Portugal and even Burma. Irrespective, Carrom today is amongst the world’s favourite indoor games, enjoyed amongst amongst friends and families worldwide. Similar to billiards, marbles and air hockey in different ways, it is easy to understand, fun to play, and suitable for children and adults alike. Despite being classified an indoor “board game”, it is quite unique in itself – neither like dice games such as Monopoly, nor like strategy games such as Chess. In fact, it is much more, involving a combination of both physical and mental elements. The advent of professional carrom tournaments over the past few decades and the formation of federations all over the Western world has given rise to thousands of serious carrom players, thereby spreading its popularity even further. Nevertheless, there is no doubt a long way to go before “carrom” becomes a household name, with millions of people worldwide who haven’t even heard the name. Carrom is played by millions of people in Asia, especially in India, Pakistan, Sri Lanka, Bangladesh, Maldives, Nepal, Malaysia, Singapore, Afghanistan, United Arab Emirate, Japan and Korea. There are national federations in most of these countries. Large number of Carrom tournaments and other activities are organised in these countries. SAARC Countries Champioships are organised every year, under the auspices of the Asian Carrom Confederation. Carrom is played in many countries of Europe such asAustria, Belgium, France, Germany, Greece, Holland, Italy, Poland, Portugal, Spain, Switzerland, United Kingdom.There are national federations in most of these countries.They organise Carrom tournaments, Carrom demonstrations and other promotional activities. The European Carrom Confederation coordinates the activities of the national federations and allots Euro Cup every year, in rotation. Carrom is becomming more and more popular in United States of America. There are Carrom associations in many part of USA. The US Carrom Association coordinates their activitiesand allots National Chapionship tournaments in rotation. Carrom has attracted many people in this continent. 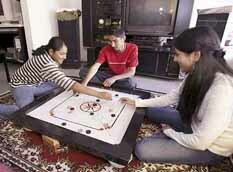 Carrom activities are organised under the auspices of the CarromFederation of Australia. in India and uniform rules were adopted. of Asia and Europe and tournamentswere organised. International Carrom Federation was established in Madras.